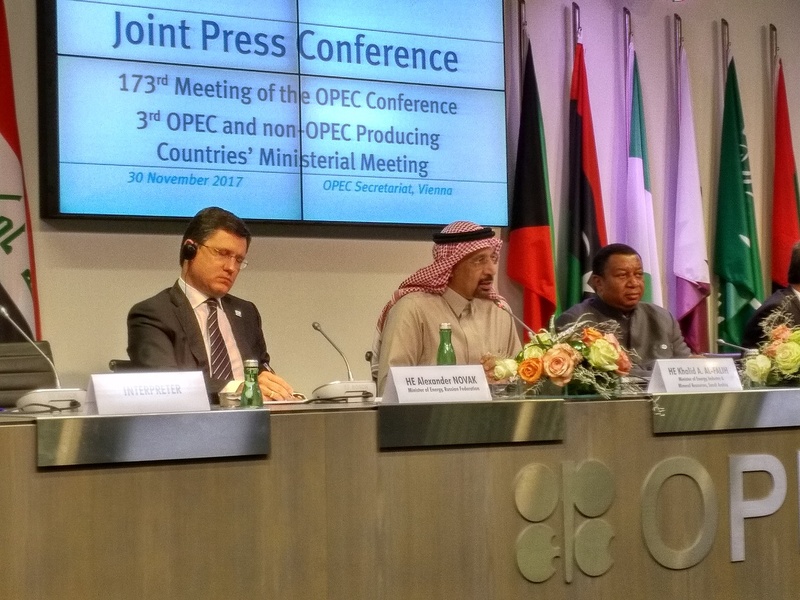 It's official - OPEC and non-OPEC producers have extended their joint 1.8 million barrels per day of oil production cuts until December 2018, following the conclusion of their ministerial meeting here in Vienna, Austria. There were some doubts that the Russians will not play ball, but in the end they did. Energy Minister Alexander Novak and his Saudi counterpart Khalid Al-Falih subsequently turned up portraying an air of harmony. It's been a long crude day, with plenty of words to punch on a keyboard, plus radio, TV and OPEC webcasts to contend with for the Oilholic who is well and truly knackered. Hence, apologies for not providing some instant and more meaningful commentary here. To make up for it, here's a spot report for IBTimes UK with some market analysts' quote. And here is yours truly's customary OPEC take for Forbes. Some more composed thoughts to follow once this blogger has had some sleep after a long hectic day; but in the interim that's all for the moment folks! Keep reading, keep it crude! © Gaurav Sharma 2017. Photo: (L to R) Russian Energy Minister Alexander Novak and his Saudi counterpart Khalid Al-Falih announce the extension of OPEC and non-OPEC production cuts at the conclusion of the 173rd OPEC ministers' meeting in Vienna, Austria on 30 November, 2017 © Gaurav Sharma. 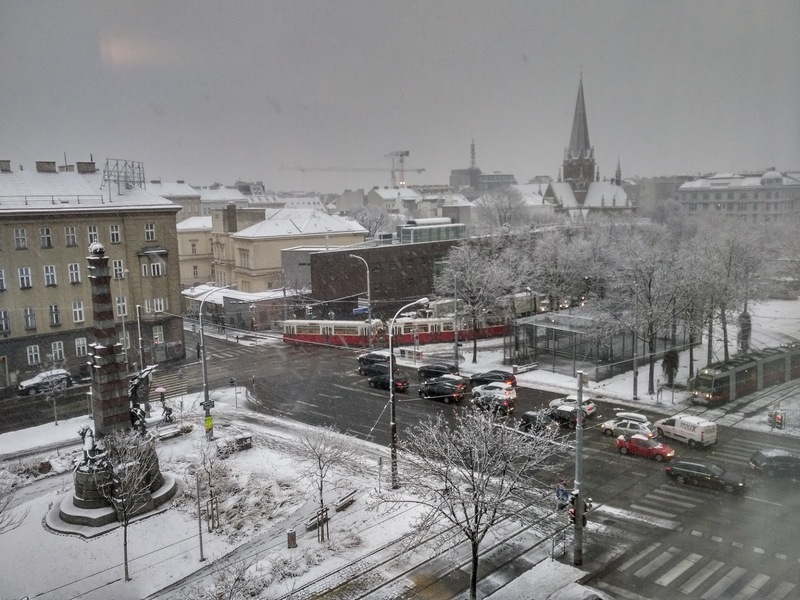 The Oilholic has negotiated some serious snowfall to arrive at Helferstorferstrasse 17, OPEC's secretariat in Vienna, Austria for the 173rd OPEC Ministers' meeting. The winter wonderland that the Austrian capital has transformed into overnight should make the Russians feel right at home. That's because all the soundbites here are about the Russians, and what they may or may not agree to this time around. The collective OPEC and non-OPEC production cut, pegged at 1.8 million barrels per day (bpd) in May, is valid until March 2018. So the question is a simple one where from here? The Gulf exporters led by Saudi Arabia want a nine month extension beyond that to cover most of 2018. However, Russian oil minister Alexander Novak is not so keen on the idea, questioning why OPEC wants to extend a deal that is yet to expire. Here's some overnight analysis for Forbes. Sooner or later Russia will part company with OPEC and the many in the market are cognizant of that. And here's the first report from OPEC for IBTimes UK. Plenty more from here soon, but that's all for the moment folks! Keep reading, keep it 'crude'! © Gaurav Sharma 2017. Photo: View of snowfall on Westbahnhof / Europaplatz, Vienna, Austria, November 30, 2017. The Oilholic has arrived in Vienna, Austria to gauge the crude temperature ahead of the 173rd meeting of OPEC ministers. Going by the events of the last 24 hours, looks like the Russians, in town leading the 10 non-OPEC producers, seem to be giving the most briefings, and mostly to Russian journalists and analysts. You could be forgiven for thinking they'd joined OPEC; but the Kremlin's message to analysts and scribes alike seems to be a simple one - the current production cut agreement reached in concert with OPEC producers for taking out 1.8 million barrels per day (bpd) out of the market is valid until March 2018, so why tamper with it now? On the other hand the few odd soundbites coming out of OPEC seem to "express hope" the cut agreement, of which the cartel has a lion's share of 1.3 million bpd, is rolled over for a further nine months. With both parties not appearing to be on the same page, oil futures are sliding. At 7:45pm GMT, Brent is down 0.53% or 34 cents to $63.27 per barrel, while WTI is down 1.09% or 63 cents to $57.36 per barrel, making it a second successive session of intraday declines extending from European hours to US trading hours. Expect more of the same, though OPEC's problem is the lack of an exit strategy, which is why some in its ranks want to kick the can down the road even if the Russians aren't keen. Meanwhile, since its been over 10 years of covering OPEC by the Oilholic, here's a look back at the last ten years for IBTimes UK. A whole lot memories, episodes and experiences to narrate. Finally, here is one's take on what to expect on IG Markets TV and Core Finance TV. And that's all from Vienna, for the moment folks! Plenty more to follow. In the meantime, keep reading, keep it crude! © Gaurav Sharma 2017. Photo: OPEC signage outside its secretariat in Vienna, Austria © Gaurav Sharma. 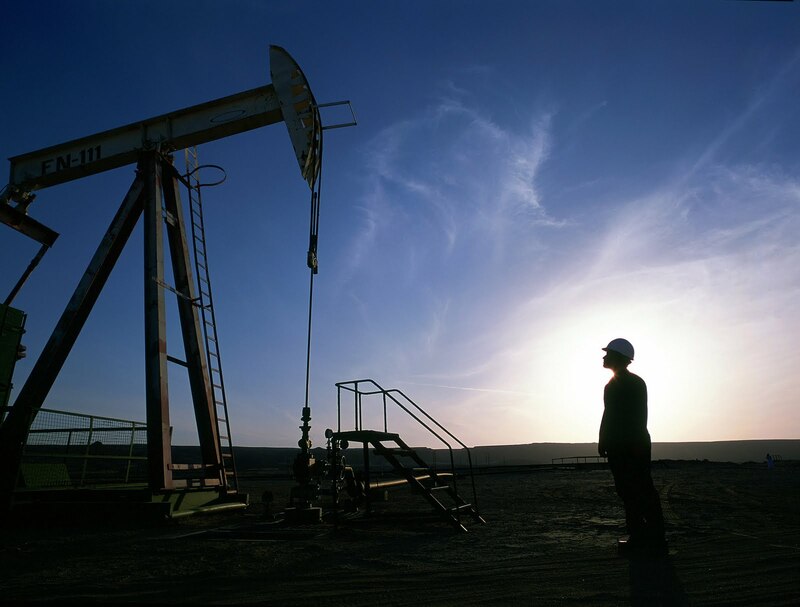 Automation, artificial intelligence and robotics keep cropping up in discussions, conferences and speaking engagements the Oilholic least expects them to these days – from trading seminars to oil and gas congresses, economics forums to academic debates. The energy industry talks of connected plants, exploration and production firms talk of advanced robotics, refineries and downstream companies send drones out to monitor facilities and traders fret over algorithms replacing them. 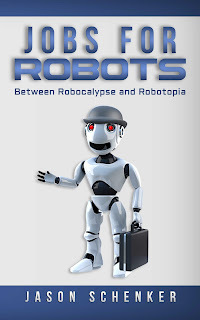 So is this ‘Robocalypse’ or ‘Robotopia’? This blogger’s close industry colleague, friend and renowned economist Jason Schenker says mankind is somewhere in between, and has attempted to address the information gap via his book Jobs for robots: Between Robocalypse and Robotopia; a most impressive narrative summing up the tremendous opportunities as well as significant threats the future holds with a healthy infusion of pragmatism, analysis, wit and humour. The tone of this book, of just under 200 pages split by nine engaging chapters, is neither alarmist nor utopian about the fourth industrial revolution that's underpinned by technology or 'Industry 4.0' as some prefer to call it. What the author is attempting to do is review the way forward – that is unquestionably fraught with challenges – and see how we can prepare ourselves, bridge the gap, especially the skills gap, between the rapidly evolving present and the imminent future. In parts, the narrative is blunt because it needs to be. Some jobs that exist today, will most likely disappear tomorrow. This isn’t something new, as the author points out. Past industrial revolutions led to millions of jobs disappearing, but also led to the creation of newer ones. Industry 4.0, Schenker stresses, will be no different with downsides and upsides. It’s how we embrace the upside and mitigate the downside via education, reforms and re-skilling so that individuals and society can reap the benefits from the upcoming age is what it’s all about. My overriding impression upon reading the book is that its for everyone. Afterall, it is discussing the future and how we should gear up for it – and that’s something that concerns everyone. What is so brilliant about Schenker’s work is that its part analysis, part historical perspective, part futuristic, part career advice and part financial planner. And the sum of all parts makes it among the most informative and engaging works on future planning out there in the market, written in free-flowing simple language that would appeal to as diverse a readership base the Oilholic can possibly imagine. This blogger immensely enjoyed Schenker’s book and is happy to recommend it to fellow beings eyeing what the future holds for us, and how we need to embrace and prepare for it. Riyadh, capital of the world’s most prolific of crude oil producing nation – Saudi Arabia – has been rocked by both physical and political bangs this weekend, the Oilholic notes. Overnight, state TV confirmed the Saudis had intercepted a ballistic missile aimed at Riyadh's King Khaled Airport fired by Yemen’s Houthi rebels. Witnesses reported loud bangs and parts of the destroyed missile were found in the airport’s car park. The Saudis are leading a campaign to defeat the Houthis, as part of an international air coalition that has bombed the rebel group since 2015. Who else, but Iran, purportedly backs the rebels. Following the physical bang, came the political bang later in the day in the form of surprise dismissals and arrests of dozens of Saudi ministers, royals, officials and senior military officers by the country’s Crown Prince Mohammed bin Salman. Even by secretive Saudi standards, the move is unprecedented. It points to an audacious attempt by the Prince to consolidate his power base and move closer to his ultimate objective of ascending to the country’s throne. His father King Salman has been doing his bit too. Under convention, Prince Mohammed bin Nayef, a seasoned royal, was first in line to the throne to succeed Salman. But the King ousted him from the line of succession and stripped him of his role as interior minister. Earlier in his reign, King Salman had removed his half-brother Prince Muqrin from the line of succession. By April 2015, the king had appointed Prince Mohammed bin Salman as second-in-line to the throne, giving him the title of deputy crown prince, a move that surprised many senior members of the ruling Saud family. Now through what on paper appears to be an anti-corruption purge, the father-son duo have all but made sure of Mohammed bin Salman’s safe passage to the throne. However, in highly tribal Saudi Arabia, reports suggest the move has not gone down well. How it all plays out in terms of geopolitical risk and the impact all of this could have on the oil price remains to be seen. For now at least, it’s just a few crude bangs, albeit at a time the oil price is back above July 2015 levels. That’s all for the moment folks! Keep reading, keep it crude! © Gaurav Sharma 2017. Photo: Oil extraction facility in the Middle East © Shell.